Make a Scooby Doo collar that fits over your dog’s regular collar! Measure your dog’s collar. Cut a rectangle of teal fabric to the size needed. 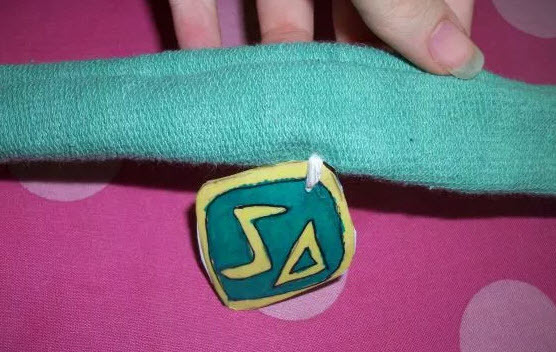 Cut a diamond shape from a piece of paper to make the dog tag, and decorate the tag with Scooby’s initials. Glue the paper onto a playing card, cut off the excess card, then coat the tag with Mod Podge. Poke a hole near the top of the collar, thread a string through the hole, poke a hole in the center of the fabric rectangle, and knot the string through the hole in the fabric. Sew the long edges of the rectangle together to make a fabric tube. Fit the fabric tube over your dog’s collar, and use Velcro fasteners to hold the ends of the collar cover together if needed.